McClellanville Real Estate is starting to see some movement. After six months without much activity and no property moving in town, June has ushered in a new surge in activity. Still not what I would call normal levels of activity, it could be a sign that things are getting back to normal. In the last several weeks two homes have gone under contract, one has already closed and several lots have gone under contract with two already closing. There are a few short sales that require patience in dealing with the bank, but offer an opportunity for savings. In addition, we have seen prices drop considerable, so a number of deals exist around town. With all that McClellanville has to offer, there hasn’t been a better time to buy in town for some time. Located in McClellanville’s “Downtown”, across from the Pinckney Street Kitchen, W.P. Baldwin & Associates are the McClellanville Real Estate Experts. 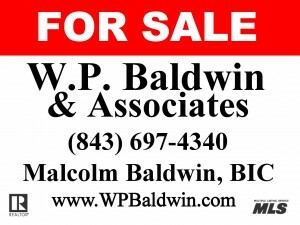 Stop in at 829 Pinckney Street or call Malcolm at (843) 697-4340, or email malcolm@wpbaldwin.com.